According a recent CBS News poll conducted at the end of October, a slim majority of 51 percent continues to think that marijuana use should be illegal. But support for specifically allowing doctors to prescribe marijuana for serious medical conditions - or legalized "medical" marijuana - is far stronger: 77 percent Americans think it should be allowed. Still, even though most Americans support this, just three in 10 believe that the marijuana currently being bought in this country under state-authorized medical marijuana programs is being used in the way it has been authorized: for alleviating suffering from serious medical conditions. A recent CBS News Poll conducted nationwide finds 40 percent of Americans think the use of marijuana should be legal, while 51 percent think it should not. The percentage that favors legalizing marijuana use has been steady for the past two years, but it is larger than it was when CBS News first asked the question back in 1979. Younger Americans support legalizing marijuana more than older Americans. Slightly more than half of those under thirty favor legalizing the substance (52 percent), while Americans between 30 and 44 are divided. Older Americans tend to oppose legalizing marijuana, particularly those 65 and older (62 percent). Most women (54 percent) oppose legalizing marijuana, but men are divided: 46 percent of men favor legalizing it, while 47 percent oppose. Regionally, support for legalizing marijuana is strongest in the West, a region that includes 10 of the 16 states that have some form of legalized medical marijuana use. Forty-eight percent of Americans in western states think marijuana use should be legal compared to 45 percent who think it should not be. There are differences in terms of both party affiliation and political philosophy. Seven in 10 Republicans oppose legalizing marijuana, while Democrats are divided and independents lean towards legalizing it. Two in three liberals think marijuana should be legal while two in three conservatives think it should not be, and moderates are divided. While a slight majority of Americans oppose the idea of legalizing marijuana in general, more than three in four think that doctors should be allowed to prescribe small amounts of marijuana for patients suffering from serious illnesses - the conditions for use that are set up in all of the states that have legalized medical marijuana programs. Support for this cuts across age, gender, region, and political affiliation. 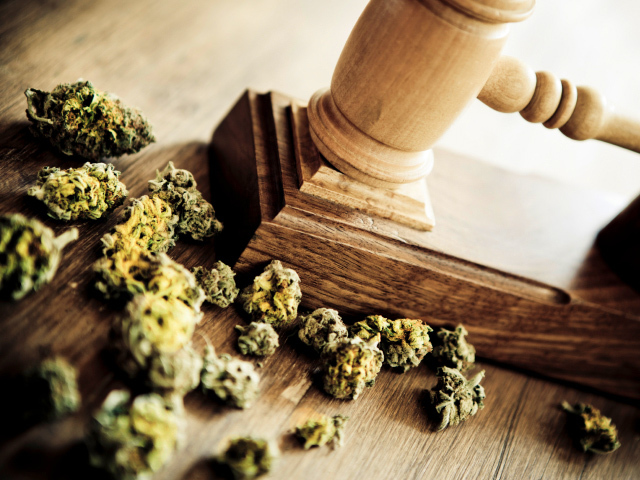 But Americans are skeptical that most of the marijuana purchased in the U.S. through state authorized medical marijuana programs is being used in the way it has been sanctioned. Just 31 percent of Americans think marijuana purchased under such programs is being used to alleviate suffering from serious medical illnesses. More than half - 52 percent - think it is being used for other reasons, including four in 10 of those who think marijuana should be legal in general.